I can definitely help you to lose weight and reach your health goals, since I have helped many others to lose body fat and keep it off. After thoroughly reviewing your health history, recent laboratory reports, and discussing your health goals, I will weigh you, and measure your body composition with bioimpedance analysis. In office blood glucose testing and urinalysis for Ph may be performed. If you have not had any recent laboratory testing done, I may ask to have some testing done by your MD or with a local lab or with one of the specialty labs that we deal with, including Spectracell and Genova. Then I will design a custom nutrition and lifestyle program to help you reach those goals. The recommendations are easy to follow and you do not have to weigh anything. I will discuss and recommend specific exercises and the duration and intensity of the exercise, as well as other lifestyle recommendations. Since there are a number of toxic substances that are common in our environment that have an obesogenic effect, I may want to start with several weeks of detoxification to clear some of these chemicals out of your body. Such obesogenic substances include Bisphenol-A and perflurooctanoic acid, one of the main toxic chemicals contained in teflon pans, and these are present in the bloodstream of 95% of Americans. These obesogens disrupt our metabolism, affect our hormones, and lead to increases in fat cells. Our version of detoxification would involve specific dietary restrictions along with a medical food supplement that supports both phase I and phase II of liver detoxification. I will ask you to return for follow up visits so I can monitor your improvements and coach you and adjust your program till you reach your goals. I will repeat the bioimpedance analysis on each visit, so I can make sure that the weight you lose is mostly fat rather than muscle or water. 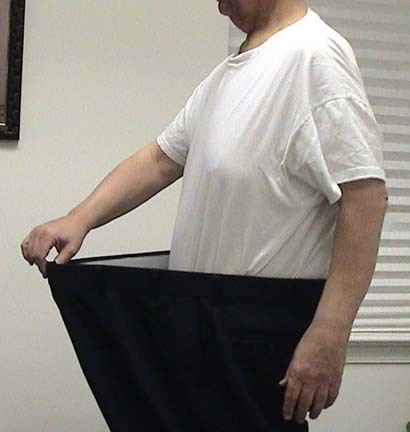 With gimicky fast weight loss programs (such as the HCG diet) many clients lose mostly water and muscle. Loss of muscle results in your metabolic rate slowing down, which makes it harder to continue losing weight. I will adjust your program to make sure that most of your weight loss is fat. With our program, no client has not reached their goals, unless they did not follow the program. I guarantee that you will also reach your goals, as long as you follow my healthy eating and exercise recommendations. By following the proper lifestyle, type II diabetes (95% of cases of diabetes today in the US are type II, which is caused mainly by diet and lifestyle) can be managed and in some cases, it can be reversed. Especially if you are not yet taking insulin. And we can prevent your pre-diabetes from becoming full blown diabetes virtually every time if you comply with our lifestyle recommendations. Let’s try to understand how type II diabetes develops. Each time you eat a carbohydrate that causes your blood sugar to spike–high glycemic carbohydrates–your pancreas secretes insulin to lower the blood sugar. A steep spike in glucose results in a large secretion of insulin. But insulin is very inflammatory and the cells do not like being exposed to a lot of insulin. When this process is repeated over and over from eating high glycemic carbohydrates, eventually, the cells start walling themselves off from insulin and insulin resistance develops. The next time your blood sugar spikes from high glycemic carbohydrate ingestion, your pancreas will have to secrete more insulin to lower your sugar since the cells are now resistant to insulin (insulin resistance). Eventually over time, the pancreas is no longer able to keep up with the demand. This is the process that results in type II diabetes. In the initial stages of diabetes, the pancreas is still secreting insulin, though not enough to do the job with the level of insulin resistance that exists in your body. The goals here is to make your cells more sensitive to insulin and to regulate your blood sugar with diet, exercise, and supplements. Intervening at this stage, gives us the best chance of getting your diabetes reversed and getting you off medication. Once you are on insulin injections, reversing diabetes is quite a bit more difficult. That’s not to say that you cannot manage insulin dependent diabetes more efficiently and decrease your need for insulin. The less insulin you need the healthier for you. How do you know if you have diabetes? It is defined as having a fasting blood sugar of 126 or above or a Hemoglobin A1C (glycated hemoglobin) of 6.5 or above. The most common symptoms are increased thirst, increased urination, increased hunger, and big dips in blood sugar that lead to lightheadedness, fatigue and irritability, etc. Unfortunately, many clients with type II diabetes have no obvious symptoms. And if untreated for years, progressive damage to pancreas function can occur and then damage to various organs as sugar residues start building up. Like with many conditions, the earlier you can start treating diabetes with diet and lifestyle changes, the better. Make an appointment and let me help you get your sugar levels under control and reduce/eliminate/or prevent your need for medication. Hypothyroidism, a sluggish thyroid, is a common condition and most cases of hypothyroid are caused by an autoimmune condition, referred to as Hashimoto’s hypothyroidism. 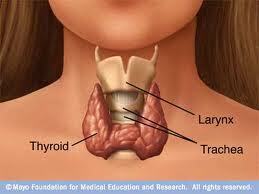 Hypothyroidism is often treated with thyroid hormones, such as Synthroid. But if it is caused by an underlying autoimmune condition that is leading to the progressive destruction of thyroid tissue, then simply treating it with thyroid replacement hormone will not stop the condition from gradually getting worse. I advocate an integrative nutrition approach that attempts to balance your immune system and reduce the underlying autoimmune condition. This requires looking for the underlying causes and triggers for the autoimmune condition, such as nutritional deficiencies, chronic infections, gut dysbiosis/leaky gut, toxins, altered adrenal function, low male or female hormones, etc.. This will likely require some lab testing to figure out the root cause(s). On the other hand, if your hypothyroidism is not autoimmune related, then supporting the thyroid gland with selective nutrients and modifying your diet is a better strategy. 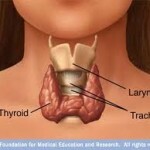 In a percentage of cases, you can avoid taking thyroid medication. In other cases, your need for medication can be decreased. We may want to test whether you need iodine or whether you have bromine or flouride, which can block your body’s ability to utilize iodine. Hyperthyroidism, a fast thyroid, which is less common, is also often caused by an autoimmmune condition (Grave’s Disease). Like with hypothyroidism, I recommend following an anti-inflammatory strategy to dampen down the autoimmune condition. The strategic use of supplements and foods that interfere with thyroid function can be helpful in slowing the thyroid down in such cases. 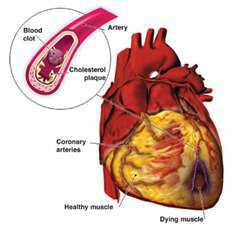 I have helped many clients to manage their blood pressure and cholesterol levels naturally without drugs. With the right nutritional approach, vigorous exercise, and targeted neutraceuticals, you would be amazed at how your cholesterol and triglycerides levels improve. I have seen clients total cholesterol and triglycerides come down over 100 points in three months, just with lifestyle changes. We can simultaneously see the HDL (good cholesterol) levels increase. Such changes are much more dramatic than can be achieved with drugs. I can also help you to lower your homocysteine levels, your blood pressure, and your HsCRP levels (this stands for High Sensitivity C Reactive Protein, a measure of inflammation). These are all significant risk factors for heart disease and for most people they can be controlled with diet and lifestyle changes. Pharmaceuticals should be a last resort if your body fails to respond to personalized diet and lifestyle changes. Advanced cardiovascular testing may be recommended, as there are a series of significant cardiovascular factors besides the simple cholesterol/triglyceride/LDL/HDL approach. The factors mentioned above–homocysteine and HsCRP are among these additional risk factors. Others include: Apolipoprotein a; small, dense LDL; remnant lipoprotein; HDL2b; and fibrinogen. There are also some genetic tests that can be run to look at genetic tendencies to chronic diseases, including the Apolipoprotein E Genotyping and the MTHFR Genotyping. Fortunately, all of these risk factors are amenable to change with diet and lifestyle changes. I can show you what changes to make to reduce these risk factors. Of course, it may take some experimentation, as not everybody responds to the same approach. This is part of the importance of working with someone like me over time as your lifestyle coach. Autoimmune diseases result from an immune system that is out of balance and is attacking the healthy cells in the body. The traditional medical approach is to treat these conditions with drugs that suppress the immune system, like Enbrel, Remicade, and Humira. I advocate an approach that tries to seek the underlying causes of these autoimmune diseases and modify these, so that the process stops. Among these causes are an immune system out of balance, toxins, gluten intolerance and other allergens, infections, a leaky gut, poor diet, and stress. Exposure to toxins may play a role in autoimmune conditions. As Dr. Mark Hyman points out on his web site, 80,000 chemicals have been introduced in the US since 1900 and only 550 have been tested for safety. And a number of studies have demonstrated that hundreds of potentially toxic substances have made their way into our bodies, including in newborns. (http://www.ewg.org/reports/bodyburden2/execsumm.php) Pesticides, Bisphenol A, mercury, lead, cadmium, flame retardant chemicals, and Teflon from non-stick pans are among these toxic chemicals detectible in our bodies. Toxins are found in our food, water, carpets, furniture, cleaning products, lawn care products, cosmetics, plastic containers, and non-stick cookware. After toxins become incorporated into our cells in our bodies, there is a tendency for our immune system to recognize these cells as foreign and attack them. This is the issue in autoimmune diseases–that our immune system is attacking our own cells. By supporting the body’s detoxification system, you can reduce your body burden of toxins. By reducing some underlying causative factors for autoimmune diseases, such as toxins, combined with an anti-inflammatory diet and prudent use of targeted nutraceuticals, in a percentage of cases, these diseases can be controlled. In some cases, the need for pharmaceuticals can be avoided altogether, while in others, fewer medications or lower dosages will be needed to control the disease process. The adrenal glands produce adrenaline and cortisol and several other hormones, often in response to stress. Our bodies are designed to respond to stress on a short term basis. The best analogy for understanding this stress response is to think of the zebra on the savanah that has just seen a lion. Adrenaline levels surge, stimulating increased blood flow to your muscles, increased alertness and mental focus, and temporary increases in heart rate and blood pressure, allowing the zebra to take off and run from the lion. Digestion slows or stops, since there is no time to digest a meal while escaping from a lion. Survival must take precedence. This stress response is beneficial for the zebra and increases its survival chances. Such stress responses can help keep us alive as well. The problem is when we experience such stress responses on a daily basis or multiple times per day. When these stress responses become chronic, they create health problems. Chronic stress can result in heart disease, digestive disorders, autoimmune diseases, sleep problems and decreased energy levels. From having to constantly react to stressful situations, the adrenal glands become fatigued and are unable to produce optimal levels of cortisol and other hormones. We may want to measure adrenal function with saliva testing, so we can see the levels of cortisol and DHEA throughout the day. By learning stress coping techniques and/or changing your life situation to reduce your stress, exercising to naturally channel stress, and a supportive diet and supplements you can rebuild you adrenals. Osteoporosis and osteopenia both refer to low bone density, which increases the risk of fractures. 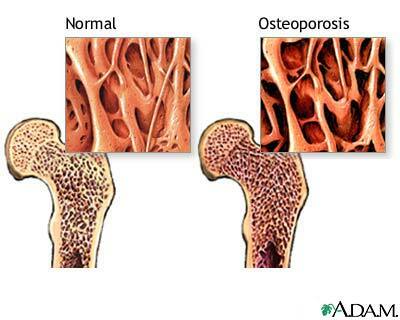 Mild decreased bone density is osteopenia, whereas more severe loss of bone density, below a certain level (a T-score of less =2.5 on a bone density test), is referred to as osteoporosis. 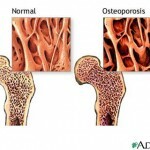 About 10 million Americans over the age of 50 have osteoporosis and an additional 34 million have osteopenia. These numbers are growing as our population ages and our high acid, standard American diet leaches calcium out of our bones. As a result of low bone density, 1.5 million Americans suffer a fracture each year and these fractures can be debilitating. For example, the death rate for those over age 65 after a hip fracture is up to five times as high as normal. Americans drink the most milk of any country, yet we have one of the highest rates of osteoporosis. Why? Some have referred to this as the milk paradox. Obviously, milk is not as effective a food for increasing bone density as we thought and just drinking milk is not as protective against osteoporosis as once thought. While getting enough calcium is important, it is not the only factor. If your overall diet makes your system acidic and your dihydroxy vitamin D levels are lower than optimal, then your calcium intake will be neutralized and unabsorbed. Also, cow’s milk may not be the best source of calcium, since it is difficult to digest and many have allergies or sensitivity to milk. Also, since milk contains a lot of protein, this may cancel out some of the calcium, given the acidifying effects of milk. I can examine your overall diet and lifestyle and recommend lifestyle changes that will increase your likelihood of maximizing your bone density. This is why our FirstLine therapy lifestyle change nutritional counseling program is more effective than just giving you some supplement recommendations. I will recommend an alkaline diet that will encourage increased bone density. Dark leafy greens not only contain lots of calcium, but they are also very alkalinizing. Such a bone friendly, alkaline diet also has the many additional benefits, including reducing blood pressure. My general approach to cancer is to create an environment in your body that makes it more difficult for cancer to grow and spread. This is something that you should do before cancer starts, after it starts, and continue to do after it is in remission. The standard American diet, our highly stressed but sedentary lifestyle, and our toxic environment create conditions that foster the growth of cancer cells, so we have to do the opposite of this. We need you to lead an active lifestyle and eat a low glycemic, Mediterranean diet that is rich in phytonutrients that are found in fresh, organic vegetables, fruits, nuts, legumes, whole grains, and limited amounts of lean, grass fed meat and poultry or wild, cold water fish, like Alaskan salmon. We also need you to use techniques to help you manage your stress, like progressive muscle relaxation and relaxed abdominal breathing. My integrative nutrition program is not an alternative to traditional forms of cancer care such as surgery, radiation, and chemotherapy. It is an adjunct to it and I will make recommendations that are based on scientific research but are also very specific to you. And yes there are now hundreds of studies showing that certain eating patterns and supplements can improve the outcome of your care. For example, research shows that a hs-CRP level below 1.0 improves survival from cancer by 40%! (McMillan DC, et al. 2001: Measurement of the systemic inflammatory response predicts cancer-specific and non-cancer survival in patients with cancer. Nutr Cancer69) Some supplements can actually enhance the effectiveness of certain chemo meds or radiation, such as green tea extract enhancing the effectiveness of Adriamycin. I will take care to make sure that none of my recommendations will interfere with or decrease the effectiveness of your conventional care. On the contrary, I will aim to make your conventional treatments more effective and help to counter some of the side effects of the chemotherapy and radiation that may make you better able to tolerate them. For example, ginger is a natural treatment for nausea related to chemo. I will attempt to treat you the person, while the chemotherapy and radiation target the cancer cells. My goal is not only to improve your lifespan but the quality of your life as well.